Uganda (/juːˈɡændə/ yew-gan-də or /juːˈɡɑːndə/ yew-gahn-də), officially the Republic of Uganda, is a landlocked country in East Africa. 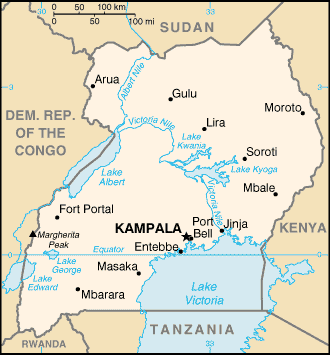 Uganda is bordered on the east by Kenya, on the north by South Sudan, on the west by the Democratic Republic of the Congo, on the southwest by Rwanda, and on the south by Tanzania. The southern part of the country includes a substantial portion of Lake Victoria, shared with Kenya and Tanzania. Uganda lies within the Nile basin, and has a varied but generally equatorial climate.